A study mapping genes associated with two cancers common in golden retrievers could lead to better prevention and treatment of the disease in dogs as well as similar cancers in people. 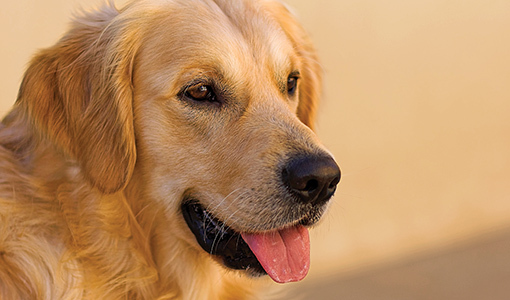 The research, published in PLOS Genetics in February, found that variations in the DNA sequence at two separate but neighboring regions of the genome are linked to increased risk of lymphoma and hemangiosarcoma in golden retrievers. These DNA variants are associated with changes in the expression of genes involved in the body’s activation and regulation of T cells, which are important for antitumor response. Individual dogs in any given breed have very similar genetic blueprints, unlike most human populations. For that reason, scientists looking to identify markers for canine disease can quickly recognize and disregard the large stretches of DNA that are identical in dogs of the same breed. In addition, artificial selection over time has led to the heightening of genetic risk factors for certain diseases within breeds. Studying the genetics of hemangiosarcoma—an incurable cancer of the cells that line blood vessels and affects one in five golden retrievers—may also lead to more information about its parallel human cancer, angiosarcoma. Only about one in a million people gets angiosarcoma, so “there just aren’t enough people affected to do this kind of genetic study effectively in humans,” says Megquier, who holds a D.V.M. and a master’s in comparative biomedical sciences from Cummings School. Veterinary researchers at Cummings School teamed with scientists from the Broad Institute, Uppsala University, North Carolina State University, the University of Minnesota and Colorado State University on the study, which began as two separate research projects looking at B-cell lymphoma and hemangiosarcoma. However, as the Broad Institute scientists analyzed the two sets of genetic data, they realized that the same changes in the DNA sequence were associated with both cancers. That finding was unexpected. Although they’re both cancers of the circulatory system, hemangiosarcoma and B-cell lymphoma are fairly different because they occur in different cell types in the body, says Megquier. Hemangiosarcoma can occur in any organ, most commonly the spleen or heart, and the cancer can be lethal when the blood-filled tumors rupture, causing hemorrhaging. Lymphoma, one of the most common cancers in dogs and people, develops from the white blood cells, called lymphocytes, that help fend off infection. Tumors are most often found in the lymph nodes, often first noticed as fast-growing lumps around the neck, shoulders, armpits, knees and groin. “About half of B-cell lymphomas in dogs tend to be a subtype called diffuse large B-cell lymphomas, and that’s one of the most common subtypes of lymphoma in humans as well,” says Megquier. Before these recent findings, no one suspected both cancers had genetic similarities. How these genetic changes predispose golden retrievers to cancer is still being investigated. Megquier theorizes that these genetic risk factors may diminish the body’s ability to find and eliminate tumor cells, rather than increase the likelihood of normal cells becoming cancerous. Whereas in a healthy animal, the immune system would kill potentially malignant cells before they had a chance to proliferate, perhaps “if you are unlucky and you have both of those [genetic] mutations, your immune cells just aren’t quite as good at it,” she says. The researchers plan to use their findings as a launching pad to identify the exact mutations responsible for the two cancers and their consequences in the body. “That might lead us to thinking about new therapies, which is really exciting,” says Megquier. Reliable genetic markers could produce genetic tests to identify dogs at higher risk or to help breeders decrease the incidence of hemangiosarcoma over time. The cancer has an unusually high prevalence in golden retrievers, suggesting that related genes may have been inadvertently selected for over the history of the breed. “I’m really interested in empowering both our vets and the owners to make more informed decisions for treatment of these dogs,” she says.